It is primarily the magnificent landscape and natural beauty that has made Kanchanaburi such a major tourist destination in Thailand; with numerous visitor, natural and cultural attractions including waterfalls, caves once inhabited by Neolithic man, well-cared for national parks, virgin forests and of course the rich heritage of Thailand that is preserved in the temples, museums and traditions of the area. Many visitors come for the outdoor adventures like golfing, trekking, elephant rides, rafting, canoeing, mountain biking, bird-watching and the delights of the diverse wildlife of Kanchanaburi; for those seeking the cultural delights, the journey has plenty to reward. Kanchanaburi is a reflection of its past, when the Three Pagodas Pass, a break in the Thanon Thongchai Mountain Range that divides Thailand and Myanmar, was a primary trade route from India and the place where Buddhism is said to have first come to Thailand around the 3rd century. Relics, architecture, customs, cuisine and dialects are today’s evidence of when the province and its pass were under various influences, like the Khmer of Angkor in the 13th century; the Khmer temple dates from this time and is a well known attraction for visitors to the area. From the military garrison built by the kingdom of Ayutthaya that was later passed through by the Burmese who eventually destroyed the capital of Ayutthaya, to the railway built by the Japanese using POWs in World War II that became known as the ‘Death Railway’ and included the infamous bridge crossing the Kwai River, Kanchanaburi has tales to tell. 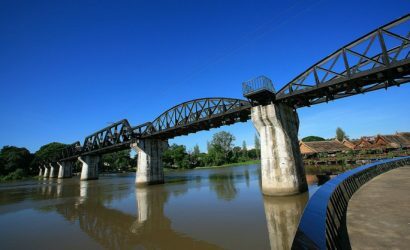 The area is also home to numerous hill tribes who accept visitors and are delighted to share their traditional ways and the city of Kanchanaburi itself, located at the point where the Khwae Noi and Khwae Yai Rivers meet and form the Maenam Mae Klong, is also known for the warmth of its welcome and the way it honours its past. The sights, sounds, stories and ways of the ancestors are preserved and shared through each generation and in Kanchanaburi, folk music and dances dating back over 500 years are still regularly performed today. With a history that dates back thousands of years, Thailand is a very popular country and has a vibrant tourist industry. Many people flock to Thailand for its nightlife and also its culture. Religious temples of various faiths are located around Thailand, such as Wat Phra That which has over three hundred steps and Wat Phra Singh that dates from the 14th century – Thailand has just as many museums. If you want to explore the cultural side of Thailand, choose Orbit Tours Thailand. With a huge assortment of cultural attractions to see, you’re bound to have a memorable holiday. The cost of each tour does vary but usually includes accommodation and airfare. Orbit Tours Thailand has a wide range of cultural tours that last for a couple of hours and several days. If you want to see many cultural attractions in Thailand during an extended holiday, you can by choosing Orbit Tours Thailand. In fact, a family with many young children can book a cultural tour through Orbit Tours Thailand because some tours are aimed at younger holidaymakers. Taking place throughout the year, you’re bound to find an enjoyable and enlightening cultural tour courtesy of Orbit Tours Thailand. Stretching over 500,000 square kilometres, which is more than twice the size of the United Kingdom, Thailand is a bustling country that has a rich history. If you want to explore Thailand and see particular places or attractions that you haven’t been to before, you can by choosing a tailored tour of Thailand through Orbit Tours Thailand. The tour which you book is entirely down to you. By telling us what you’d like to see, a tour can then be created which includes every attraction, historic building and museum or anything else that’s on your proposed itinerary. Want to play golf in Phuket or visit one of Thailand’s many temples? Or, how does exploring a Thai national park sound? The decision is completely yours because any place that’s in this majestic country can be seen. After providing Orbit Tours Thailand with your itinerary, we will then get in touch regarding how much it will cost. With no hidden fees, the quote that Orbit Tours Thailand gives will be all you have to pay. If you’ve always dreamed of visiting Thailand but haven’t found a tour company yet that travels to where you want to go, choose Orbit Tours Thailand.